A mysterious explosion on September 8th 1944 appeared to be due to the impact of the first V2 rocket to hit London. The English censor tried to cover up the enormous damage at Staveley Road, Chiswick in the released press pictures. By doing so, panic was avoided. Later the damage was fully repaired. The last V2 rocket launched from the site at The Hague fell on the village of Orpington in Kent on March 27th 1945. 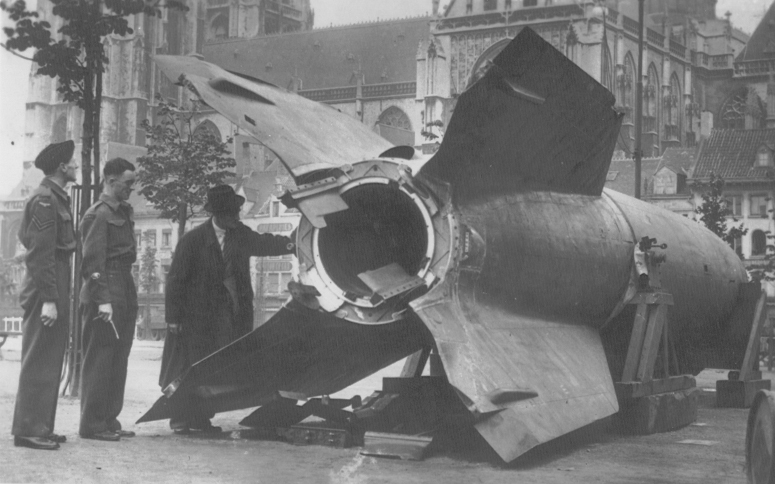 In the British damage reports the V2 hits were described as ‘Big Ben incidents’. 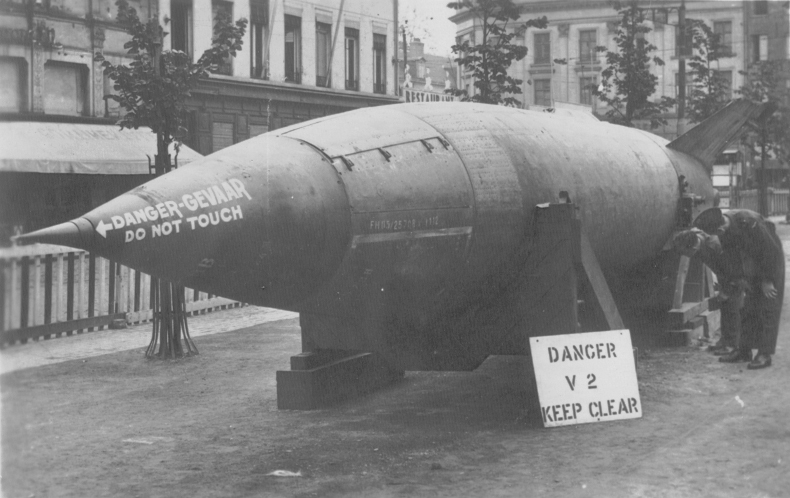 To deny the Allies the use of the Antwerp harbours, the Germans launched a large number of V2 rockets on the city which had recently been liberated. Antwerp was considerably damaged: the Teniersplein took a hit twice within three weeks: 724 people were killed. On December 16th 1944 the Rex cinema was hit, on which occasion 566 people perished. Although there were members of Allied military personnel among the victims, the strategic target (closing down the harbour) was not achieved because the V2 rocket was very inaccurate. The launching of the V weapons caused the death of 3.515 people in the district of Antwerp; 5.824 people were seriously injured and 50 people missing. 3.118 buildings were completely destroyed; 27.616 were heavily damaged and 67.659 suffered minor damage. Franssen, T.: La bataille d’Anvers; Cité de la mort soudaine. Anvers, 1945. Jennes, R.: Antwerpen: 175 dagen blinde terreur van V-wapens. In: Spiegel Historiael, Vol. 12, No. 1, Januari 1977, p. 31-37. Patteet, R.: Honderdzestig dagen van Vliegende Vergelding. Studie van de V-bommen in de gemeenten Beersel, Berlaar, Booischot, Hallaar, Heist, Hulshout, Hegem, Putte, Schriek, Wiekevorst e.a. Uitg. Heemkring Die Swane, Heist-op-den-Berg, 1994. Schuijter, J. de: Gemarteld Antwerpen. Sinjorenstad onder de V bommen. Uitgeverij ‘De Palm’ , Antwerpen, 1945. Inhabitants of Antwerp look at the horrible V2 weapon, that carried death and distruction in the city.Collection: J.M. Allis, Amsterdam.